Ok ok, I know I'm late since this is January and I am posting in February, but...that's how it goes. The final color scheme for this is going to be solids and polka dots. It isn't really a color scheme, lets call it my design scheme - yeah that! 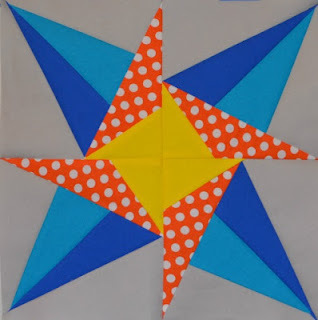 So....I present to you, my January Lucky Stars Block! Paper Piecing is such fun. It amazes me how much I love it because the first time I did it was challenging! I think I watched 3 YouTube videos no less than 10 times each, I just couldn't get it, but now...I got it and I love it! Are you good at paper piecing? I like your "design scheme" polka dots are my favorite. I'm still very new to paper piecing, but I find it very rewarding. YOur January block is beautiful. Great job on your star. I'm sticking to the Dancing Stars. Too many other projects in the works. Very lovely design! We do love paper piecing, right? Freedom Pattern has been released! Madrona has crossed the finish line! Yet another BOM for 2013!